The main reason why most of us use residential proxies is anonymity. Also, residential proxies help you to avoid geo-restrictions and are perfect for web scraping. Thanks to residential IPs, you can easily imitate the real user’s behavior and surf the web from any location in the world. Here at Proxyway, we spent our days testing various proxy providers. 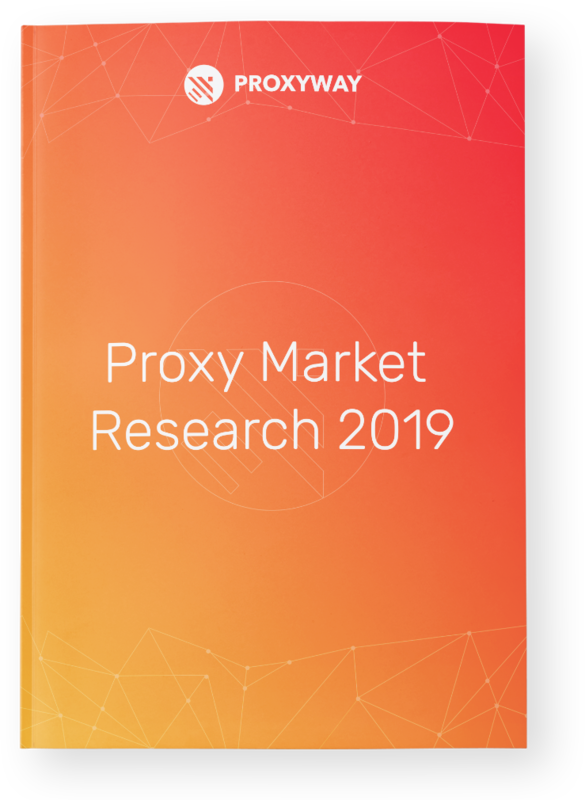 Currently, we have thoroughly tested and written nine in-depth reviews on residential proxy providers. You can find the full list here. Today, we’ll be taking a closer look at the companies that made to our top 3 – Oxylabs, Geosurf, and Smartproxy. 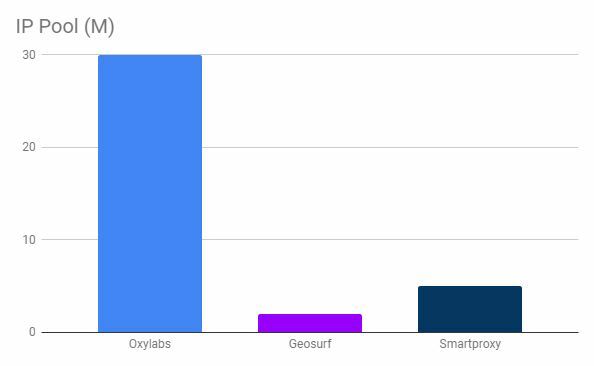 Compared to Geosurf and Smartproxy, Oxylabs has a way bigger IP pool with over 30 million residential proxies available. As for locations, both Oxylabs and Smartproxy offer IPs from over 190 countries, so if you need proxies from specific locations, chances are Oxylabs or Smartproxy will have them. In terms of features, all three providers offer limited bandwidth, have session control features, support HTTP protocol, and use whitelisted IPs as an authorization method. However, similarities end here because compared to Geosurf, Oxylabs and Smartproxy have many more useful features. With Oxylabs, you can create an unlimited number of sub-users, filter proxies by location, ASN, provider or carrier, and use credentials for authorization. Smartproxy also offers credentials as their second authorization method, but you can only filter by a location and create a limited number of sub-users. Both Oxylabs and Smartproxy support HTTPS protocols, whereas Geosurf supports only HTTP. Compared to Oxylabs, Geosurf and Smartproxy offer more dashboard features. You can renew your plan directly in their dashboards, whereas with Oxylabs you have to contact your account manager. However, compared to other providers in the proxy industry, all three companies have pretty decent dashboards. You can see your usage statistics, change your credentials or whitelist your IPs, so we give a big thumbs up to all three. We spoke with customer support representatives of all three proxy providers, and, to be honest, all of them did a great job. However, we selected Smartproxy as the runner-up for the Best Customer Service award because their support team was extremely helpful and they were super fast whilst replying to our questions. Communication with Geosurf’s and Oxylabs’ teams also went very smoothly, however with Oxylabs, you get a dedicated account manager; therefore the customer support is extremely professional even if you purchase a small number of proxies. 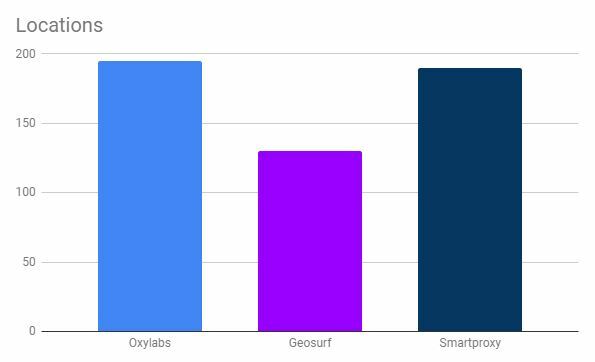 As you can see, Oxylabs, Geosurf, and Smartproxy have very high success rates. 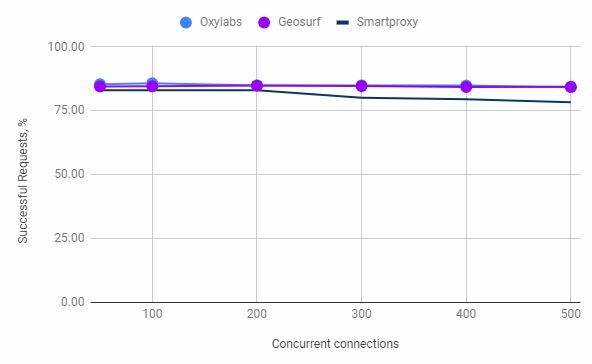 Only Geosurf has slightly more blocked IPs, whereas Oxylabs and Smartproxy have a bit more connection errors. However, compared with other providers all three companies have highly performing proxies, so you’ll be fine by choosing any of them. While testing the performance of the proxies, we noticed that both Geosurf and Oxylabs have extremely stable residential proxies. No matter how much we increased the load, the success rates stayed the same. Smartproxy’s success rate slightly dropped with a higher load, but still remained at a very high level. You can see more detailed performance test results in the full reviews of Oxylabs, Geosurf, and Smartproxy. In terms of average response time, all three providers are doing better than the industry’s average. 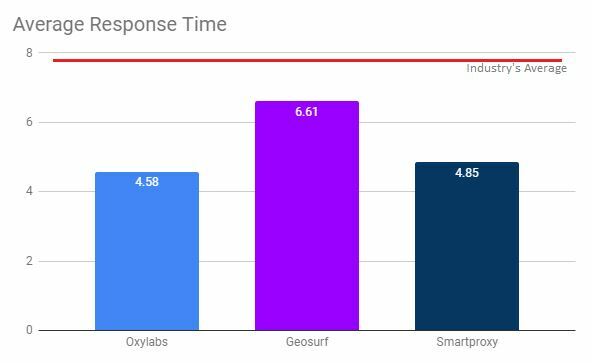 As you can see, Oxylabs clearly wins over Geosurf with the average response time of 4.58s. Smartproxy has extremely fast proxies too and is a strong competitor to Oxylabs. 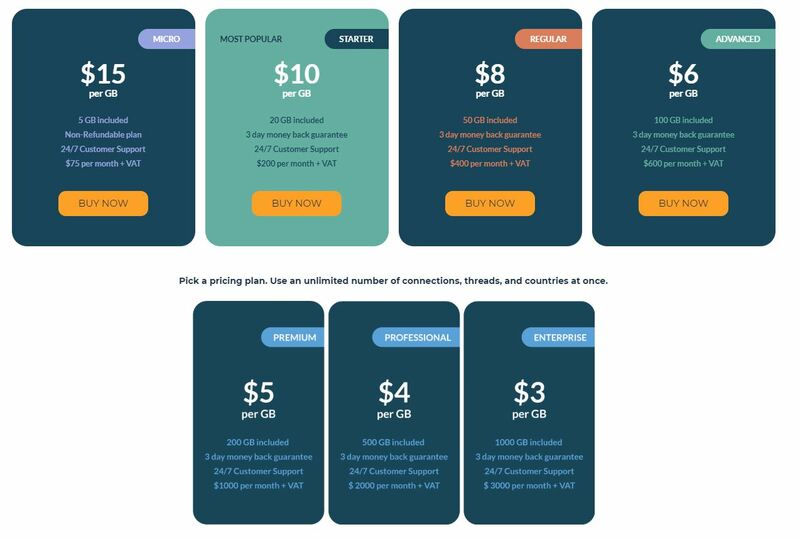 When it comes to pricing, Smartproxy offers the biggest variety of options. They have seven different pricing plans, including a micro plan which is great for small scale scraping projects. With all three providers, you’ll be paying per GB. It means that the price depends on how much traffic you’re using. At the beginning of this year, we announced the winners for the Proxy Service Awards 2019. So, I guess it comes as no surprise that the top 3 residential proxy service providers collected several trophies. 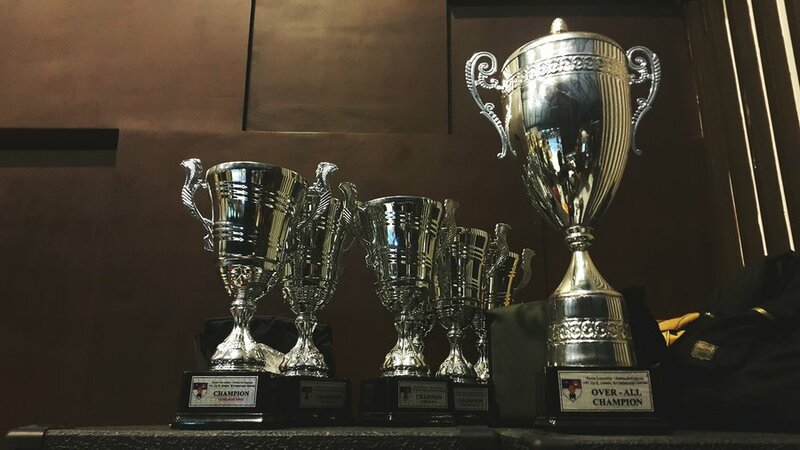 Oxylabs won in three categories: Best Overall, Most Stable, and Least Blocked residential proxy provider. Geosurf also won in the Most Stable category, whereas Smartproxy was chosen as Editor’s Choice. As you can see, we couldn’t find almost any significant issues with any of the three proxy providers. Their residential proxies performed very well, and the speeds were impressive. Oxylabs has the biggest IP pool, Smartproxy’s dashboard is terrific, and Geosurf’s proxies surprised us with a high success rate. So, how should you choose the right proxy provider? Well, we believe that at the end of the day, it all boils down to your needs and the scale of your project. So, the best advice we can give you is to get in touch with all three proxy providers, request a free trial, and try the proxies out for yourself. However, if we really REALLY had to choose just one, we’d pick Smartproxy (Editor’s Choice for a reason). Let us know which residential proxy provider would you pick by leaving a comment below!